$200 off current pricing on any Silver, Gold, or Platinum Package (now through July 4th)! Are you ready for a great senior picture experience that you cannot find anywhere else? Camera shy? That's no problem at all!!! You will have the best experience EVER taking pictures when you come to us! We are personable, exciting and fun to work with! No pressure here! Just be yourself and have fun! That's what we are all about! We will pose you to look your best!!! Just come with a good attitude and a smile on your face!!! You cannot find another studio around like us around! Trust me! We like to have as much fun as possible when taking your senior photo's, so not only do you have pictures to remember, but an experience and friends that you will remember for a lifetime! We encourage EVERYONE to bring props that show who you are! Your sports equipment, Sports uniforms, Musical instruments, School jackets and rings, activity related items (dance, art, school clubs, etc.) Hobbies, your car, if you bring it we will incorporate it into your senior photo's! Our sessions start at $50, contact us for more information! Trust me you will not be disappointed!!! We Work with your school if you would like your yearbook headshot taken! We will deliver it to the school at no charge to you! We are also offering great Referral specials! Love your pictures with us? 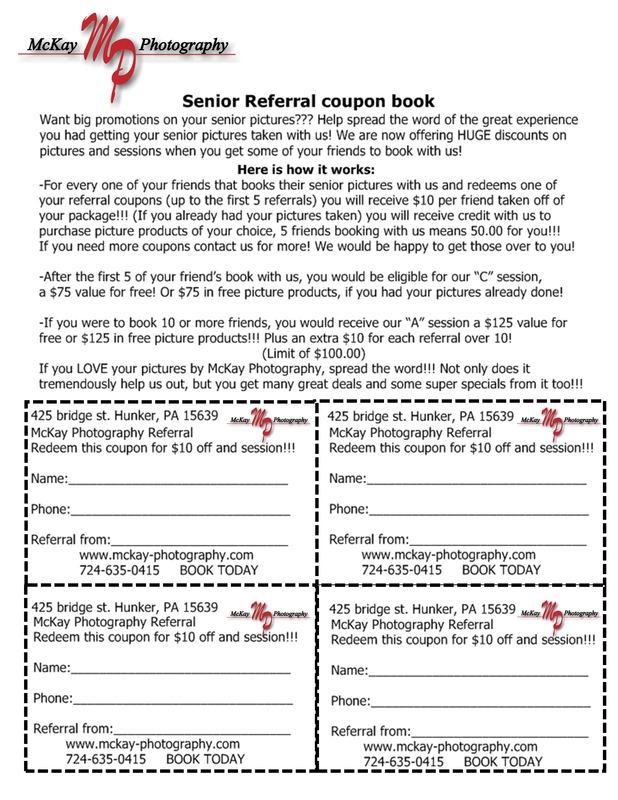 Tell your friends about us and get a free session or free picture products! Contact us today for more details! Our Studio is located in Hunker, PA right outside of New Stanton, we shoot in studio and outdoor at our park next door! There are so many different picture poses that are possible its always hard to pick a favorite! We can also come to you, if you prefer a park or your house it's your choice! Call Us for you appointment today!!! 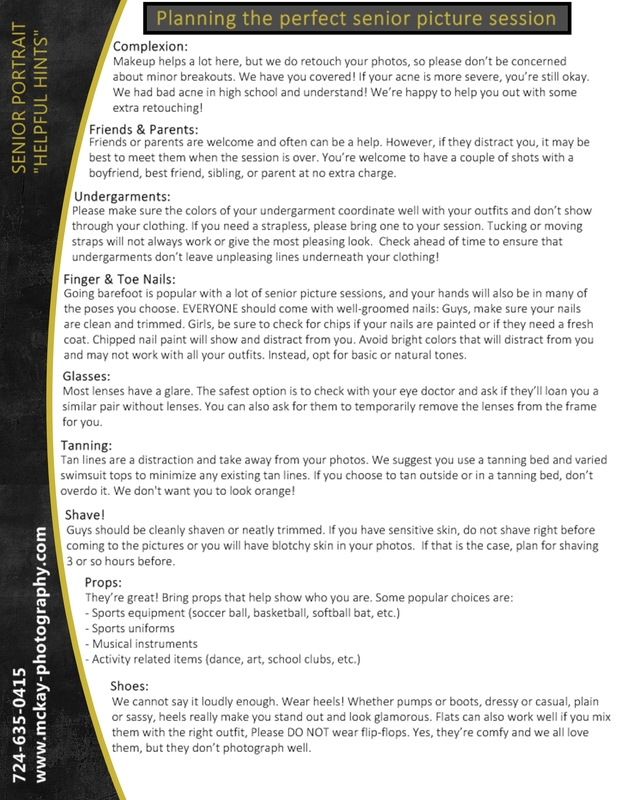 Here is some helpful information! 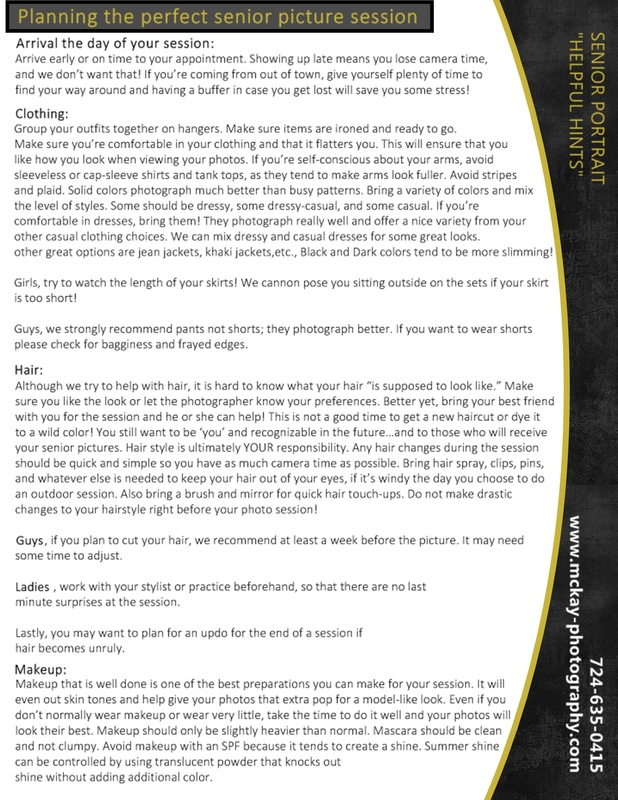 You will want to fill this Questionnaire out before coming to us on your picture day!